The Raedthuys Group has purchased and will deploy four ZephIR 300 lidars for wind measurement campaigns to assess wind conditions at the various wind farms the company has under development. The ZephIR 300 lidar units are currently being calibrated at the test site of Ecofys WTTS in Lelystad, following their industry approved factory validation at the UKs Lidar and Sodar test site. With the application of ZephIR lidar technology in the development of wind farms, Raedthuys continues in its leadership in the Netherlands. As a leading player in this market, the company has to deal with many different locations, topographies, site conditions and access restrictions. The purchase of four units allows Raedthuys to measure at many individual projects over the coming years and ZephIR was specifically chosen due to its flexibility in deployment. 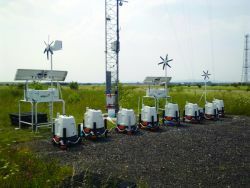 ZephIR 300 provides wind measurements up to 200 metres from installed level and importantly down to just 10 metres to provide on-site correlations with both tall and short met masts, forming an integral part of anemometry campaigns in the wind industry, through to site operations where the system is used for power curve measurements both at ground level but also in turbine-mounted applications.